special features while you enjoy a walk in the great outdoors. two of the 100 most important ‘heritage’ trees in Scotland. The most remarkable of all trees at Kelburn is the Weeping Larch, which spreads over about a quarter of an acre between the tennis court and the Plaisance. This unique mutant is thought to be 180 years old and is like no other. Its branches grow out in all directions and those that touch the ground seem to regenerate themselves, travelling sometimes upwards again and sometimes along the ground like a snake. Some of the branches have fused into other branches and, unless closely inspected, it is difficult to believe that this great monster is, in fact, all one tree. In the walled garden are two magnificent yew trees which have been dated at over one thousand years old and are thus older than the castle and the estate. They are deemed to be two of the finest in Scotland. They make the most perfect location for weddings and often the bride and groom will exchange their vows under these ancient giants. They are also a wonderful picnic spot or somewhere to take a moment to reflect and enjoy nature and all its glory. We do ask parents to supervise children and request no climbing on these trees in order to prevent any harm. 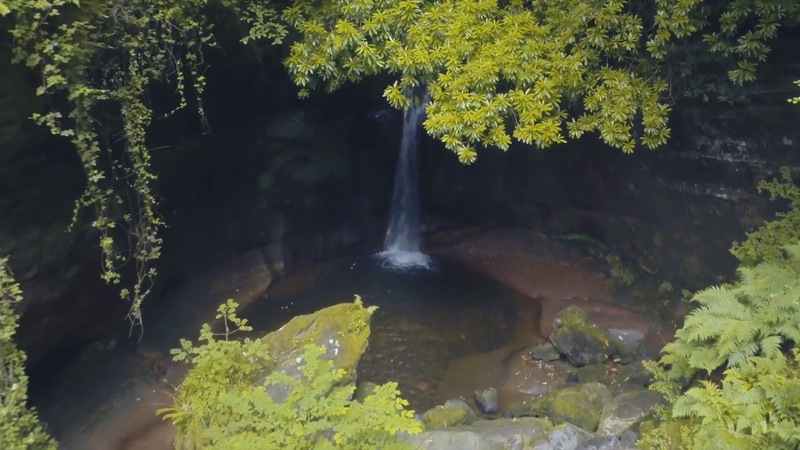 At the bottom of the Glen and only one hundred yards from the castle, the burn drops a sheer 20 feet into a spectacular grotto surrounded on three sides by overhanging cliffs of sandstone. Up until 1951, the fall of water from a smaller waterfall that also spills into the grotto, was used to generate electricity for the castle. In 2017 Kelburn reinstated a hydroelectric scheme and the water once again generating renewable energy. After visiting the fall return to the glen paths and follow the river up to the three fall and further still up the South Glen path to the oldest bridge on the estate ‘Bowbrigg’. ‘Plaisance’ is a French word meaning a pleasant place. It is a formal garden walled on three sides. Old paintings show it was likely to have been built in the late 18th century. The iron gate on the north side of the garden was a present given to the 8th Earl and his wife by the estate workers in 1956 on their Golden Wedding Anniversary. On the gates, you will see the dates of their marriage and the double-headed eagle, which is the Boyle family crest. This area is home of the 1000 year old yew trees. There is colour in this garden almost all year round with stunning rhododendrons, an assortment of shrubs and herbaceous plants, magnificent magnolias and cherry blossom to delight. A wonderful spot to relax and unwind with a book, a picnic or just in comfortable silence. In 1769 the 3rd Earl ordered this box garden to be planted for his son and three daughters. It forms the shape of the Scottish flag with the children’s initials planted in miniature hedges in the inside corner of the four individual gardens. The initials stand for Lady Elizabeth, Lady Helen, Lady Jane and Lord George (later the 4th Earl) Our gardens are tended by ‘Chris the Gardener’. Chris joined the team in March 2015 and does an amazing job of looking after the gardens and wider grounds. He is incredibly hardworking and one of his challenges has to been to revive the box hedge of the Children’s Garden and preserve this wonderful saltire.